Our passion is to create highly detailed, performance-friendly and realistic scenery and aircrafts for your Flight Simulator! As well as creating sceneries by your request on our website! Behind FlyHigh Simulations is a very simple idea. We want to make your dreams come true! We want to create sceneries which you can request with some clicks on our website. We are going to create share our sceneries with the rest of the world for no payment or even a small one. Noone will be paid for his work in this project. For more informations about donations and payments check out below. But before we can start on anyones dream airport, we have to create one of our choice. 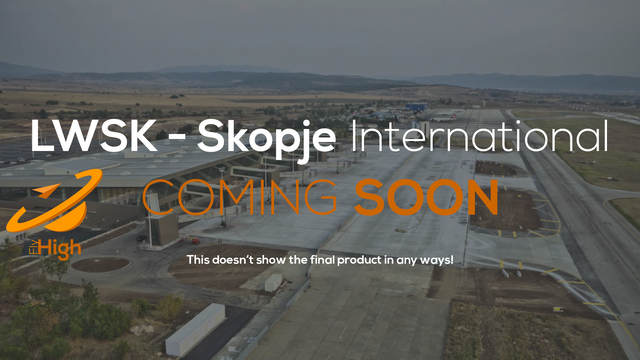 We've choosen the airport of Skopje. Just to show our users what they can expect from us with their dream airports. Before we can start with anything of it we need alot of information about the airport. And to get them it's as easy as you think. And this is where you all come in the game. Since August this year, we have a small team of (even yes) one person on board of FlyHigh Simulations. Let me tell you who it is and what I do. And yes of course, we are searching for other developers to help. For that check out our Facebook page. My name is Mischa Binder and I'm the manager of this project. I'm working on the website, the products and inside the team. I'm managing the team, all our users and customers as well as everyone else of our community! Web Developer - We need someone who is able to setup and even develop a website further and further. As well as a application including shop system and IPORTANT: Manage the security of the whole project. Yes. This is a huge job! 3D Modeller - We need someone to model and texture the needed buildings of the airport and the surrounding area. We use your donations to pay our servers on a monthly base, as well for the development! We don't earn anything with your donations, we all are non-paid workers for this project! Please be aware that we have to pay to get some original materials for something like aircraft plans or building plans. That means in general: Noone who is involved to this project will be paid for his work. All of the money we earn will go into the production of our products and the infrastructure (server, network, plans, etc.). And if (I hope that won't actually happen. But you always need a plan B) the project would be set as cancelled. We wouldn't even keep the money. We will either donate it to another developer or a online network. If we won't be able to get a website up and running as well as the hole project we won't be able to give you all of your rewards! In this case we won't charge back your money but use it for the stated above organisations! Copyright © 2018 FlyHigh Simulations, All rights reserved. It will be delivered right when you joined us as a patreon! All rewards will be assigned ONE time, not each month! The Discord-role will be delivered right when you joined us as a patreon! The 3 Free Products will be delivered as soon as we have our website up and running and we have released our first product! The Giftvoucher of Simmarket will be delivered after 1 Month of subscribtion. The 5 Free Products will be delivered as soon as we have our website up and running and we have released our first product! With the amount of 50$ per Month we will be able to get a website up and running.